Phillip H. Snowden was appointed to the University Of Missouri Board Of Curators in 2015 by Gov. Jay Nixon. Snowden represented Clay County in the Missouri General Assembly for 18 years, including 10 years in the House and 8 years in the Senate. As a legislator, he sponsored and passed dozens of bills into law. For more than 30 years, Snowden has practiced law and been a consultant to many businesses and a real estate owner and developer. 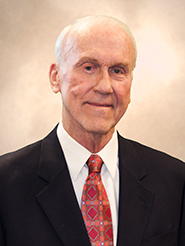 He has served on various boards and commissions and was a member of the Kansas City Missouri Charter Commission and the KC Missouri Employee Retirement Board. Snowden earned both a bachelor’s of arts in economics and a juris doctorate from the University of Missouri, and was the starting quarterback for three years and led the Missouri Tigers to the 1960 Orange Bowl. He serves on the Economic Department Leaders Board for the University of Missouri, volunteering his time and talent to promote the Department of Economics, further its teaching and research missions, and assist with fundraising.